Newsletter: Survey results are in — No New Taxes! Survey results are in: No New Taxes! The first week of session is always a hurried time — so many speeches to watch, so many meetings to attend, so many things to do. But after last week, I was able to take time to sit down to read the nearly 600 responses to my presession survey I mailed out around Christmas. If you did not get a chance to take the survey, CLICK HERE. The surveys went out to thousands of people across the district, regardless of political affiliation. And I heard back from people on all points of the spectrum. The results were so overwhelming that I wanted to share them with you. 91.21 percent said you do not want employers to pay a tax on every person they employ. 60.6 percent said employers should be offered a tax credit for every person they employ. 87.02 percent said Washington should not tax any form of personal income. 83.5 percent said that every Washington manufacturer should pay the same reduced rate as Boeing. 91.04 percent said the state should not raise taxes at all in 2019. 88.35 percent said they are not willing to pay more for energy as a result of shutting down the Snake River dams. 89.68 percent said we should protect the state’s ‘Rainy Day Fund’ in case of a recession or natural disaster. 95.17 percent said that the state should follow the same budgeting rules as most households – don’t overspend. When reading the comments about your priorities for the Legislature this year, I saw a lot of concern about mental health, but I also saw overwhelming concern about higher taxes, particularly property taxes. There was significant support for my bill that would provide a property tax exemption for seniors, veterans and disabled persons as well! We have a record amount of unexpected revenue right now thanks to a great statewide economy, and we should not jeopardize that prosperity with unrealistic spending and higher taxes. We need to listen to YOU. We need to live within our means. We need to maintain a balanced budget. And we need to protect our reserves. But we do NOT need to raise taxes. In fact, the reason I am sponsoring my tax relief bill is because I believe it is time to give something back as a thank you to all of you who have paid into the system for so long. Thank you to everyone who responded to the survey. I never forget that I am in Olympia working for you. Your feedback was, and always will be, invaluable. Watch my weekly video update! Special note: Did you know that the governor’s recent budget proposal would result in a 32-cent-per-gallon increase in your gas tax?? Many of you who responded to the survey said that addressing your higher car tab fees should be a top legislative priority. I’ve heard from constituents across the district that they can’t afford to license their car when the fees are three to four times the amount they were last year. 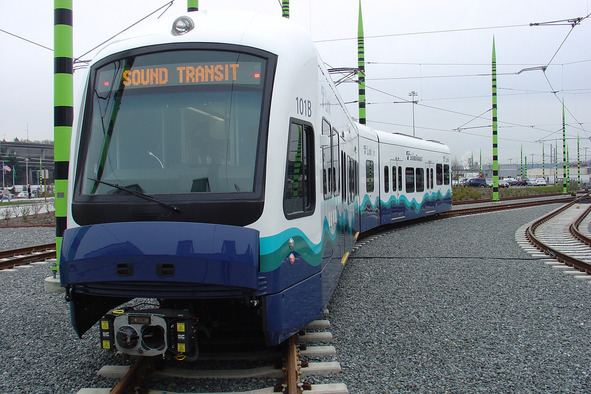 Single parents, seniors and others who are in the middle- and low-income tax brackets are driving with expired tabs because they expected to unwillingly fund Sound Transit’s ST3 light rail project. Did you know that not only did Pierce County vote down the project, but that Sound Transit has taxing authority but its board isn’t elected by the people? Simply put, it is taxation without representation. This is why I am cosponsoring Senate Bill 5220, which would require that Sound Transit’s board be publicly elected and accountable to YOU, the taxpayer. SB 5220 would create a commission that would establish 11 voting districts, each of which would elect one board member for a term of four years. If the board member moved out of their district, they would lose their seat. Regardless of how you feel about mass transit in the Puget Sound, our country was founded on rejecting taxation without representation. This founding principle applies just as much today to those public entities who have the authority to tax the public. Let me know what you think. Watch my interview on TVW’s “Inside Olympia” on opening day. 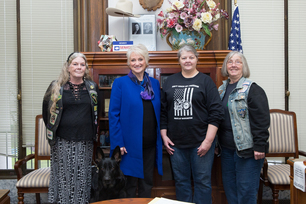 Thank you to the members of ABATE of Washington who stopped by to see me while they were on campus this week. Contact me to set up a time to chat or take a tour.